CENTRALIGN ULTRA STANDARD offers true bore center measurement, not just bore straightness. It measures whether multiple bores are in line with one another and with the rotating centerline of the shaft. Its measurement results to ISO 9000/MIMOSA standards can be documented through any OFFICE PRINTER. The configuration can be tailored to meet the unique demands posed by a particular job and predefined values can be entered to compensate for thermal growth on shaft sag. 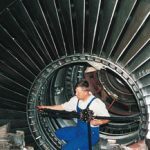 Different brackets are available to cover a range of bore diameters. The CENTRALIGN ULTRA STANDARD system brackets allow you to rotate a receiver (sensor) within a bore with diameters from 4 3/4″ up to 31″. The offset between bores can be measured to the nearest 0.0001″. The particular bore type (i.e., simple, long, or complex) can be prescribed for each bore. 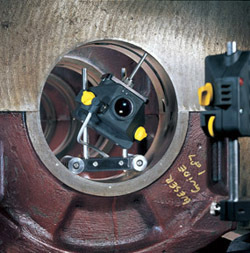 This means that the angle of a bore with respect to any other bore can also be compared. 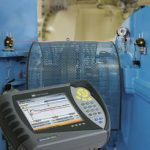 On your command, the tool can display graphically and in tabular form the offset of each measured bore with respect to the static reference laser line. A significant advantage of CENTRALIGN ULTRA STANDARD is that the reference laser line does not even have to be initially perfectly centered. An optimized position for each bore relative to every other bore is visually displayed. It is your option to choose any desired bore(s) as your reference. Also, a differential solution can be chosen, whereby the offset of any bore relative to a line between its two nearest neighbors is seen. The CENTRALIGN ULTRA STANDARD can also measure and display the alignment of the bore train to a rotating reference such as a boring tool.